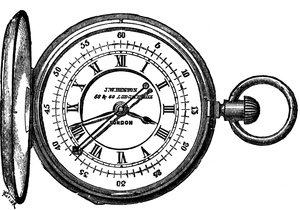 This type of stop watch was invented in 1816 by Louis Moinet to track astronomical objects. The author didn’t share information about this specific chronograph drawing but I think it’s a great pocket-watch and timepiece drawing. Adds a bit of vintage and a message of time passing.